ARE YOU TIRED OF REPLACING YOUR SCREEN MESH DUE TO PET DAMAGE? PET SCREEN IS THE SOLUTION! 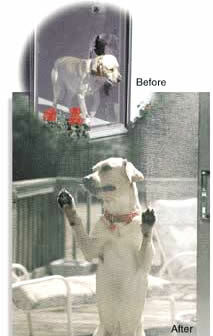 Install Pet Screen into window screens, sliding screen doors, porch screens or anywhere traditional screening is used. 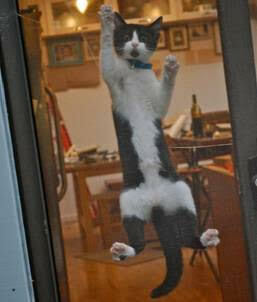 Pet Screen is resistant to tears and damage caused by household pets. You may never have to rescreen your window or door screen again. Pet screen is a heavier duty material designed to keep out the insects well maintaining your view through the screen and resisting pets. Mesh Size: 15 x 10 Wire Diameter: .025"
Pet Screen easily installs just like standard insect screen. Pet Screen is held in your window or door screen frame with the rubber spline. You can also staple the pet screen onto a wood framed screen or wood porch enclosure. Pet Screen is made from vinyl coated polyester. It is much stronger than traditional fiberglass or aluminum screening. Pet Screen is 7 times stronger than traditional screen mesh. Pet Screen is available in Black and Gray. Pet Screen is offered in the stock widths of 36", 48", 60", 72" and 96". We sell the pet screen in 7ft, 8ft, 25ft and 100ft length rolls! We have many other optional colors in the pet screen available. To view different colors please click here: Colors of Pet Screen. Remember we can manufacture window screens and sliding screen doors with Pet Screen installed in them. Where larger widths of pet resistant screen is needed or a lighter weight pet screen is desired we recommend SUPER SCREEN as another option. You may also use 80% Solar screen as it not only is pet resistant but reduces the suns heat and UV. That is two products rolled into one.